U.S. District Judge, Salvador Mendoza Jr. held a captive audience as he shared his compelling journey and some life changing experiences, while offering his best advice to Prep seniors this week. Judge Mendoza is the third speaker in the Best Advice Series program at Tri-Cities Prep. 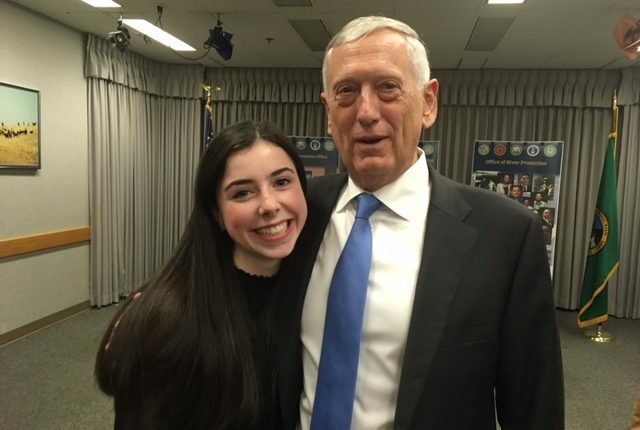 The U.S. Secretary of Defense, James Mattis, recently visited the Tri-Cities to speak with veterans who currently work for the Department of Energy. Prep graduate, Catherine Jacobs, who is currently finishing her senior year at the University of Portland, was invited to sing the National Anthem for the secretary and audience. 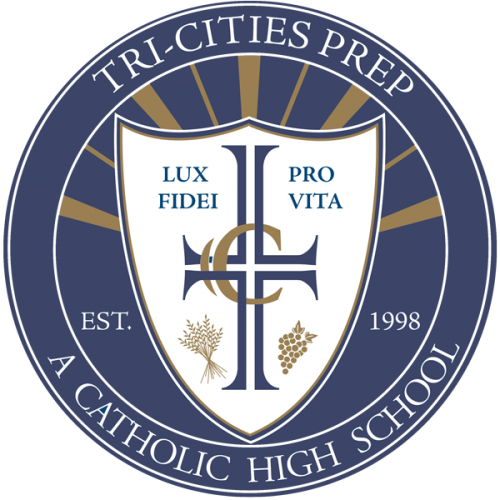 Service at Tri-Cities Prep is more than just serving a required number of hours for a grade. Prep students use their creativity and compassion to lead them to serving in ways that go beyond the ordinary. In honor of Breast Cancer Awareness Month, Prep senior, Grace Portch, decided to engage the student body in helping to raise money to donate to the Tri-City Cancer Center. Grace promoted raising awareness because cancer had made an impression on her life and family. She rallied her friends and started the fundraiser a couple of years ago and has continued the tradition each year. Students that donated were given a bracelet to help promote awareness and given a designated day to wear sweats to school. Congratulations on raising $425 this year! Pictured below are students that served recently at St. Vincent de Paul’s in Pasco. Today Tri-Cities Prep students were honored to have Dr. Jud Virden on our campus to speak with seniors in Mr. Potter’s Social Justice class. Dr. Virden is the second speaker in the new program called “The Best Advice Series” at Tri-Cities Prep. Dr. Virden, a proud parent of three Prep graduates, Will ’09, Joe ’11, and Katherine ’14 is the Associate Laboratory Director/Energy & Environment at Pacific Northwest National Laboratory. He offered students insight into what it takes to achieve your goals and advised students to “just be yourself” and to always keep trying, to never accept defeat. We are so proud of the hardwork and success our Lady Jags had this season and it didn’t go unrecognized! Several of our girls have been named to the 2017 All EWAC Volleyball Team: First Team: Emily Dickson ’20 Second Team: Talia von Oelhoffen ’21 Honorable Mentions: Elsie Dilly ’18 Grace Kruschke ’18 Congratulations to these girls and the entire Lady Jag Volleyball team… you make us #JaguarProud! The Crucible presented by Tri-Cities Prep Theater Dept.